Took these pics yesterday (Tuesday). 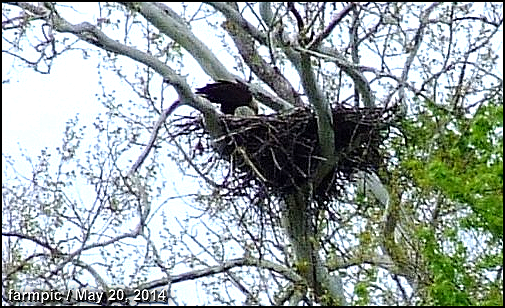 Same eagles that have been around for years (I think) but I never got a good look at their nest before. It was in a different location last year. 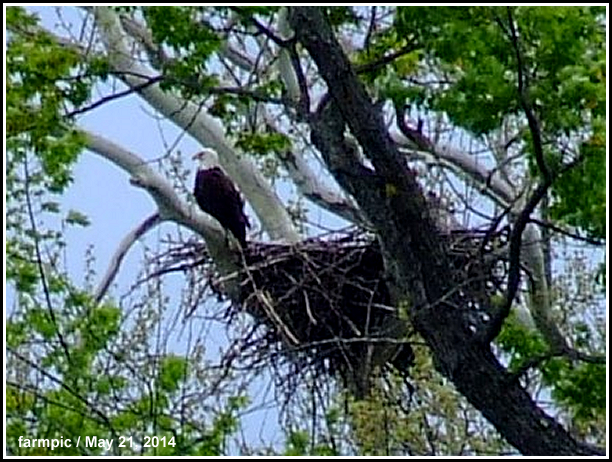 Although there may be another pair up the river a little ways since there were babies last year too. 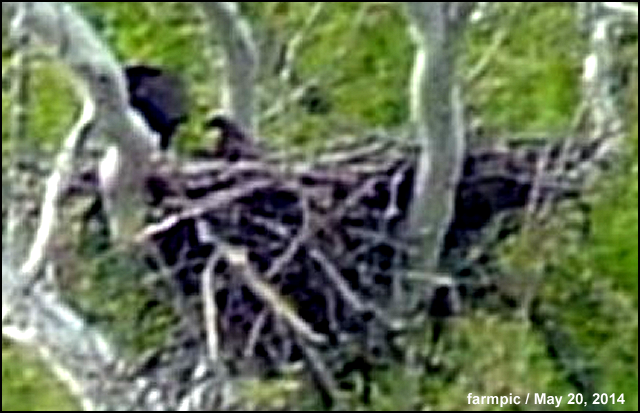 Could see the parent feeding the little one(s) - which you can see in the next pic below. 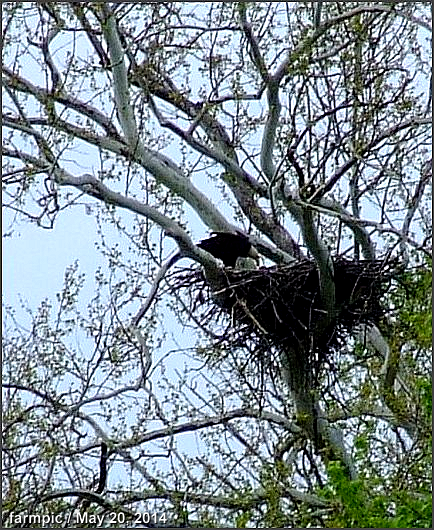 I'll try to go back tomorrow and see if I can get a better shot. I could of shot these at a higher resolution but forgot to change the camera setting at the time. Photo at left came out too blury too. Guess I was moving around or something. 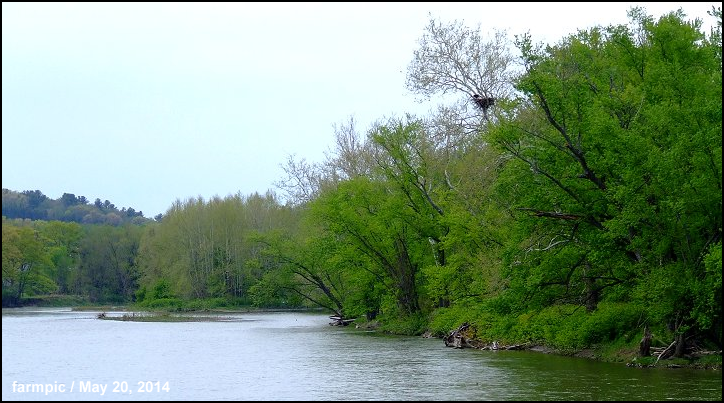 Below is river shot, with nest hanging over the happy hunting grounds. In the photo at top it looks like the big bird is feeding a fish (probably a fish) to the little one. One more: Wednesday, May 21st. 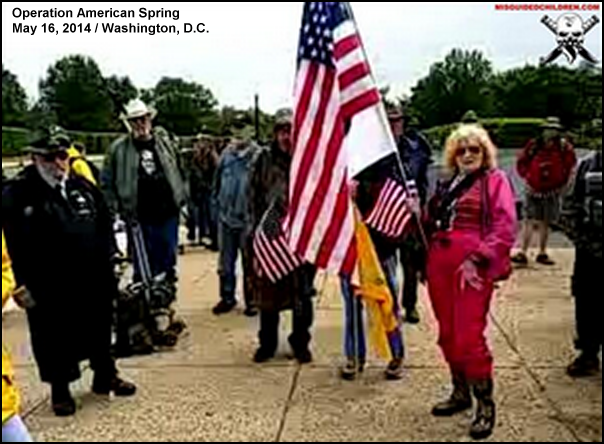 On Friday, May 16, 2014 "anywhere from a few to several million" self described "modern sheep dogs" of liberty were to blow into Washington, D.C. - like so many God marshalled wind swept ruderals - to demand the resignations and/or impeachments of "sniveling, blood sucking, undesirable" fleas like House Speaker John Boehner and Senator Mitch McConnell. According to flea roundup organizer Harry Riley (COL, USA, RET) the assembled would also insist upon the same set of unconditional surrender terms for President Obama, Vice President Biden, Rep. Nancy Pelosi and Attorney General Eric Holder... and presumably anyone else deemed worthy of remand. All of this to thwart, according to Riley, “a socialist-fascist-communist-Marxist dictatorial, tyrannical system” currently throttling America's promise of liberty, freedom and constitutional government, and so on. Because the United States of America, says Riley, "is teetering on the abyss of becoming a sniveling, blood sucking, undesirable nation (flea)." Presumably the sheep dogs would run the wolves off the land and the fleas would stop sucking on America and jump on the sheep dogs and the sheep dogs would cast the fleas into the Constitution Gardens Pond which had become, by God, a purifying lake of fire and flea dip. And (despite the Constitution Gardens Pond being consumed by a scary insecticidal fire) the multitudes of American mutton heads would rejoice, greeting the Sheep Dogs as liberators, upon seeing they were freed from the wolves and the fleas and the tyranny of invisible government fence and unconstitutional grazing restrictions and FEMA camp holding pens and IRS shearing sheds and so forth. But that didn't happen because instead, on May 16, God's wind was busy helping turn parts of Southern California into a charred Gehenna and the wolves were busy preying upon a couple of burgers and a milkshake at the Shake Shack in Dupont Circle. Dupont Circle isn't too far from the reflecting pool (a short march up 19th St. NW and there you are) but the Sheep Dogs of OAS probably didn't know that on the afternoon of May 16 because they were busy securing a base of operations and setting up a perimeter around the National Mall. And if that wasn't enough there weren't that many of them in town to begin with. Far less that the expected 10 to 30 million. Two or three hundred is probably more like it. And that's simply not enough paws on the ground to bring a jaded yet wary wolves den like Washington, D.C. to heel. Furthermore, you really need to conduct some kind of force-oriented route reconnaissance before you can send your curs of freedom charging up 19th St.NW to arrest tyranny or you'll just wind up with a FUBAR of barking mad flea bags running around in a circle in the middle of the city - getting themselves run over by convoys of ravenous wolves in armored Cadillacs - on a Friday afternoon. Thank Dear God that didn't happen. Because if there is one more thing Washington, D.C. doesn't need it's more barking crazies running around in circles and getting everyone killed as a result. 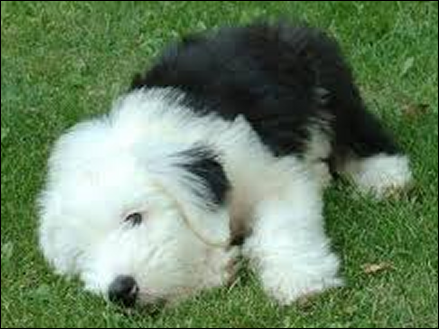 And so Operation American Sheep Dog enters Phase Two of the revolution. Which, as I understand it, consists of occupying the nation's capitol for days or weeks or months or however long it takes to drive the wolf pack from the fold. Yeah, ok. But, if you plan to visit D.C., watch where you step because I don't think I'm overestimating the potential downside inherent in 30 million unleashed sheep dogs running around town leaving fresh little landmines of liberty lying around where the laws of nature meant for em to be. After all, you are trying to win the hearts and minds of the people of the District you are occupying. So govern your natural laws accordingly. Similarly, collateral damage can have serious negative consequences for any revolution. Recall Cliven Bundy, the reigning Bundyfuhrer of the Melon Patch Porch Militia, out there in Nevada. Look what happened to that hapless dolt when he began slipping and sliding around in his own plop. Even someone clueless enough to step right in it - like Sean Hannity - backed away as fast as he could from that mess. Just to keep the stink off his own loafers. So, if OAS is going to prevail in the future, I think they might need to come up with another metaphorical theme that doesn't involve stepping in it, so to speak.
" if thou wilt not let my people go, behold, I will send swarms of flies upon thee, and upon thy servants, and upon thy people, and into thy houses:..."
Yikes, right? 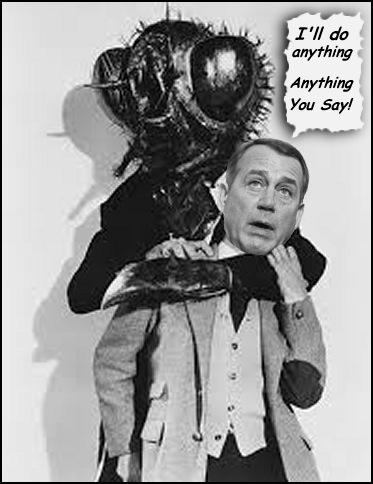 Thirty million human house flies for freedom buzzing through the halls of power in Washington! God's wind at our backs! What could possibly make a more awesome God fearin' impression upon the Pharaoh's throne of power than 30 million right-wing lunatics hopping around in fly costumes while trumpeting a medley of apocalyptic scriptural gibberish? Can't you just smell the fear and horror from here? One last important reminder to any prospective Freedom Flies who decide to put this idea into action: Just be sure to stay clear of the yellow barricade tape and any plague of frog-drones that you might run up against. Both are traps for sure. The Tyranny is sneaky that way. Very sneaky indeed.